*Great for travel: Keep track of all of your travel journeys and memories. Never forget a day from your travels. 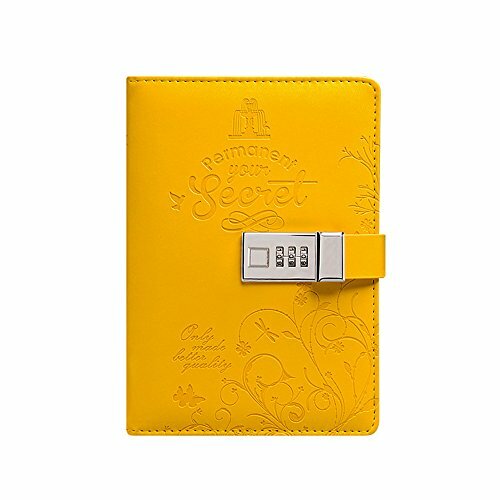 Write down all of your vacation or extended travel memories in this easy to use journal. COVER: Made of high quality PU leather, feels delicate, wear-resistant. Binding method: wire binding. Colorful covers surely will bring relaxed and joyful mood. There is always one that you are fond of. INNER PAGES: Beige writing paper (horizontal lines). Approximately 120 sheets (240 pages). UNIQUE DESIGN: With clear texture, as well as fully three-dimensional embossed design. Metal password lock, not only with a good degree of confidentiality, but also fashionable. CARD SLOT & PEN HOLDER DESIGN: Creates many small spaces for your accessories such as cards, pen, etc. PRODUCT SIZE (B6): 14 * 20 * 3 cm (5.51 * 7.87 * 1.18 in). Inner page size: 13 * 19 cm (5.12 * 7.48 in) [NOTE]: The pen is not included.